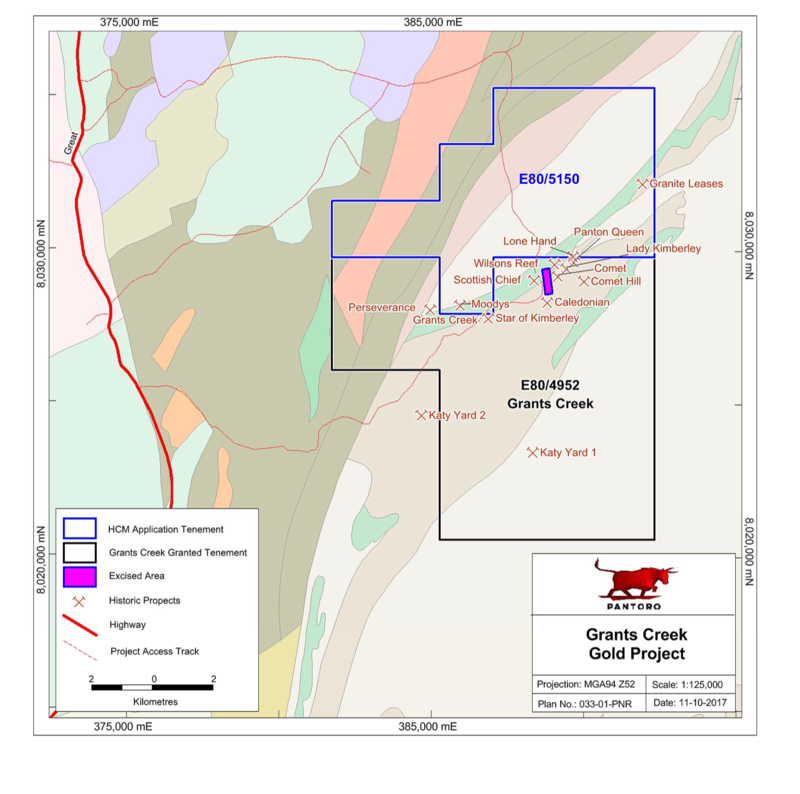 The Grants Creek Project is located approximately 60 km north of Halls Creek and includes a number of advanced prospects with first mining recorded during the 1880’s. Grants Creek has a large amount of historical drilling recorded, and Pantoro believes that there is strong potential to rapidly define a JORC compliant Mineral Resource. Previous operator, Precious Metals Australia had lodged a Notice of Intent to mine with the Western Australian government during the 1990’s, however their other mining and processing operations in the area ceased prior to commencement of the mine. Pantoro acquired Grants Creek as part of the company’s strategy to identify and consolidate prospective ground within the Halls Creek region in close proximity to the Nicolsons processing plant. Pantoro’s maiden drilling program commenced in September 2018, aimed at evaluating the open pit potential at the historical production centres of Perseverance and Star of Kimberley. Significant results have been returned from the first tranche of results received with numerous high grade assays. Excellent first drill results were announced by Pantoro on 1 November 2018. The Perseverance quartz reef is up to 7 metres wide at surface and forms a prominent ridge about 200 metres long. Drilling by Metminco in 2008 identified mineralisation to an average depth of 35 metres over a strike extent of 120 metres. The first pass drilling by Pantoro has returned the deepest intersections to date including 3 m @ 7.79 g/t Au from approximately 55 m below surface and 1 m @ 7.3 g/t from 82 m below surface. Mineralisation remains open at depth. Additionally the drill lines were extended to the north-north-east, further extending the strike of the mineralisation to approximately 190 metres along strike and remains open. The Star of Kimberley reef is a sub vertical vein which outcrops for approximately 140 metres and is approximately 2 metres wide with a sub vertical orientation. Historical production was from two shafts mined during the 1880’s, the deepest being approximately 21 metres deep.